While there may well be several stories and accomplishments I could describe about Joe Becker, most would not be complete without giving credit to my mother, Gerry Becker. While Joe was the personality and salesman, Gerry was the one who followed through. She spent many late nights in her office at our house, where I remembering stopping in to visit after being out with some kind of activity during high school, and she would postpone her work to give me her undivided attention. I hope that I didn’t cause her to stay up too much later. She was a good role model for my sisters and me, showing us the value of hard work and dedication to a job well done. Married in 1954, Joe and Gerry moved to Tulsa in 1955, raised the three of us girls and eventually welcomed sons-in-law and six grandchildren into the family. And on 27 Feb 2013, they celebrated their 59th wedding anniversary. Even before they were married, Joe had Gerry crewing for him. They had met through church, and he used to tell us that he married her for her TV. He was involved in Snipe Fleet 1 at the White Rock Sailing Club in Dallas, where they would his Snipe, #8645. When they relocated to Tulsa, they brought the Snipe with them, making news in the Tulsa paper when using a hoist to launch the boat at its new home – Lake Yahola and Sequoyah Yacht Club (I’ll have to find which newspaper and which issue, and let you know, but the photo I am posting here appears to have been a scan of the original print, not the printed newspaper article). While Joe was on the road for business, Gerry gradually made friends in Tulsa, being involved in gardening club and creating a beautiful yard with Joe’s help. 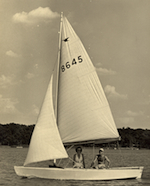 They had sailing friends, of course, and friends at the newly-formed New Haven Methodist Church. She also taught Spanish before school at nearby Carnegie Elementary School and when my sisters and I became involved in Camp Fire Girls there, she served as a leader and eventually was given responsibility for the entire Camp Fire program at Carnegie. But, she had a good understanding of business and was the person who “did the books, first for Becker Sales Co., the oilfield supply business, which was the incentive for their move from Dallas when Joe’s father, Jack Becker, invited Joe to partner with him; and then for Tulsa Sail-Craft, the “sailboat business” that Joe and Gerry decided to start in 1966. 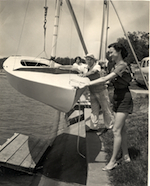 She would type just about every invoice, sales ticket, letter, and envelope as well as tallying income and expenses, and determining that the sailboat business was going to last. Joe must have typed some, too – letters, probably – because I remember getting in trouble with him for leaving the caps lock on when playing with the typewriter while it wasn’t in use. 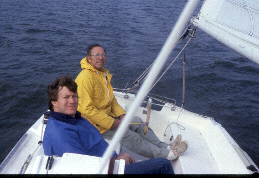 And when Joe decided to host a national regatta here in the Tulsa area (which he did more than once), Gerry was the one who pulled everything together behind-the-scenes. She had attended business school along with studying Spanish and French at the University of Texas at Arlington, and had always lived in Texas. She didn’t initially think much of the idea of moving to Oklahoma and probably secretly wished that they would one day return to Dallas, her home town. But when Tulsa Sail-Craft closed its doors in 1998, after 32 years, they had made Tulsa their home. Although they no longer sail or run a business, Gerry stays pretty busy keeping Joe in line and making sure that he has good care. She is a happy resident of the independent living center where she now lives, not far from all three of her daughters, and she is still gardening and keeping the books. She has also developed an interest in genealogy, which she tells people is because she felt that I would have enough to do trying to learn about my dad’s side and she wanted to take on the responsibility of her side of the family. We had a nice visit with my dad and mom today, where we reminisced a little about Snipe #8645 and the newspaper covering the launching at Lake Yahola, along with the latest news of the grandchildren. Happy Mother’s Day to my mother, Gerry Becker! One of my very favorite professional genealogists is Christine Rose, CG, CGL, FASG. 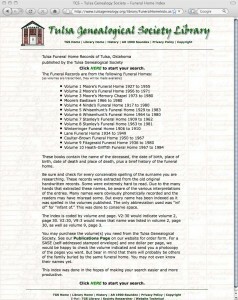 Christine presented a workshop for the Tulsa Genealogical Society in 2005. She has served on the faculty at the Institute of Genealogy and Historical Research at Samford University, and has presented numerous lectures at national conferences. You can read more at her website. She will presenting lectures at the Federation of Genealogical Societies’ 2009 Annual Conference to be held in Little Rock, Arkansas, 2-5 September. A knowledgeable and experienced researcher, Christine specializes in courthouse research, spending several months on the road every year with her husband Cecil, doing professional research and studying Rose families all over the country. She is fun and positive, yet takes genealogy and the study of evidence very seriously. She co-authored Complete Idiot’s Guide to Genealogy, with Kay Ingalls, CG, an excellent how-to genealogy book. 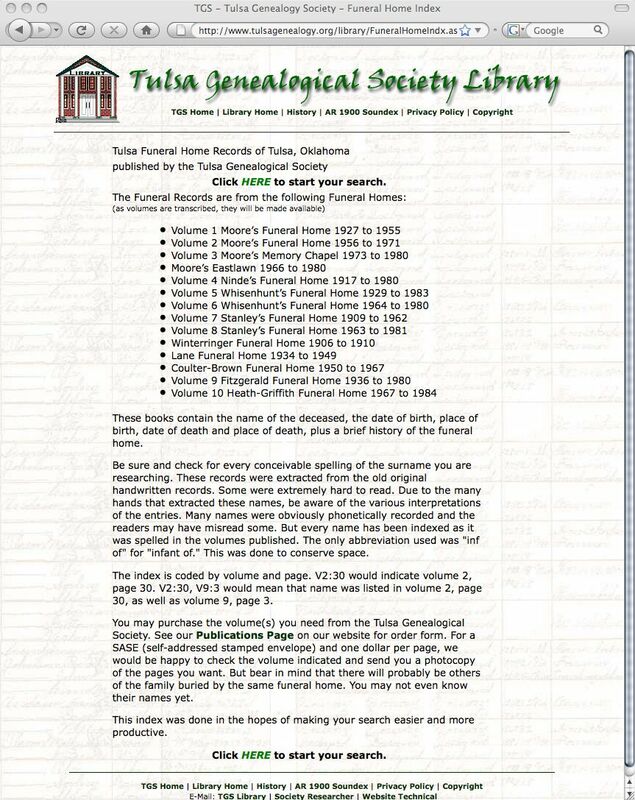 She also wrote, Genealogical Proof Standard, which I described in the mini-workshop I presented to the Tulsa Genealogical Society last May. It explains the process genealogists should use to reach conclusions. The Tulsa City-County Library is purchasing copies which library card-holders will be able to check out — one for Martin Regional Library and the other for Hardesty Regional Library. Court Records: The System and It’s Records. CG, for Certified Genealogist, and CGL, for Certified Genealogical Lecturer, are service marks of the Board for Certification of Genealogists. She is also a Fellow, American Society of Genealogists.